This week, I thought we could take a look at one of the oldest churches in our area. This church is mostly seen as a spire poking through the trees as we travel around the roundabout at the junction of Shripney Road and Chichester Road, or if we visit Bognor Regis War Memorial Hospital. It is the parish church of Bognor St Mary Magdalene. The parish rights were acquired in 1200 and the original church is thought to have been built in the mid-13th century. It is believed the present church was built about 1404. 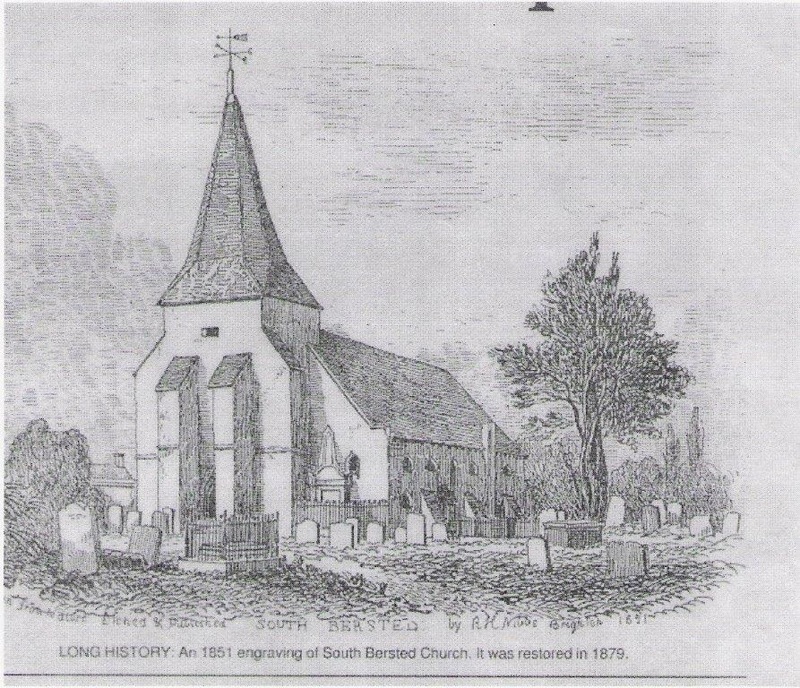 As the traffic rushes past the area, it is very difficult to imagine how the scene must have looked around 1810 when the area of south Bersted was referred to as ‘a village, north of Bognor’. The two ways to reach it were by a pathway crossing fields in a direct line from the post office, or a high road, but it was suggested that no pedestrian would choose the latter. At this time, the church was standing at the entrance to the village, but it was reported that it did not ‘claim any architectural beauty’. The path which crossed the fields is actually shown on one of the earliest maps of the area, dated 1817, and was used by the fishermen to walk to church. It was also the route taken to carry the coffins for funerals at the church. A mention in the parish records in 1679 shows a spelling of Berghstead. William Hardwicke is buried here and it was he who built the New Inn, in the High Street. This inn became known as the Sussex and is now named the William Hardwick to provide a permanent memorial to its builder. The church was restored between 1879 and 1881 following an architect’s inspection in the mid-1870s, which found there were serious structural faults in the chancel walls, roof and the buttresses, which were supporting the tower. It is interesting to read reports that even at that time there were complaints made about previous ‘tasteless alterations’ that had been carried out earlier in the century. Work was carried out to remove many of the uglier renovations such as plaster ceilings and high pews. This proves that even in the 19th century people were concerned about their heritage and the preservation of their history, rather than new ideas that had been previously incorporated into the church. Another person buried here is Mary Wheatland, the famous bathing lady who was taken to her final resting-place by the Bognor fishermen in April, 1924. Coming from a large family, there are still many of Mary’s descendants in the town. In 1999, a group of Mary’s family held a ceremony to commemorate the seat, which was placed on the outside of the church wall for weary travellers. It is the first permanent memorial to her and was provided by Bognor Regis Town Council. There are many other notables buried in this churchyard, including Major General C Teesdale, VC. KCMG CB RA, who died in 1893. He was a much decorated military hero who, when he retired, became Master of Ceremonies to Queen Victoria. Since the 1900s, the vicarage has been in Victoria Drive. Originally, it was situated beside the church, in the area that is now occupied by a housing estate. This creates a very different backdrop to the church than that experienced in the 1800s. One of the most interesting facets of this church was the parish chest, which it is believed dates from about 1200. Looking around the inside of the church, there are so many memories of previous families or visitors to the area in the form of faces on wooden beams or at the base of ceiling beams. On the south door, there is an escutcheon (shield with coat of arms) commemorating the visit of King George V to the church during his stay in Bognor. Also on the south wall there are the arms of Canterbury and the royal arms of the Hanoverian Kings. There are other curiosities such as a mass dial and a Saxon stone embedded high on an interior wall. The church itself has a shingled broached spire. The interior of the spire is made of heart of oak on to which are fastened 12,000 oak shingles. It is the king post of the spire that has bent slightly to create the slight bulge in the middle of the steeple. Work continues to be necessary and further tiling was carried out in 1986. There are a number of other areas around the church, which are considered to be of special architectural or historic interest. A number of the walls in surrounding streets, including a part of the boundary to the churchyard, are of rubble, brick and flint and considered to be 18th century or an even earlier construction. Other walls consist of brick piers, with semi-circular copings in addition to the flint. Changes continue at St Mary Magdalene. In 2002, there were major internal alterations to the church, when several pews were removed and replaced with tables and chairs to allow visitors and parishioners to have a tea and coffee lounge. Considered by some to be radical, to others seen to be a way that the church could move forward to meet the needs of the 21st century. Have no doubt that this is a superb church and certainly warrants a visit.